I took an entire month between defending my thesis and depositing it with the grad school. During that month, I mostly revised my thesis, but also I took care of a bunch of logistical things I had been putting off until after the defense: subletting the apartment, selling the car, engaging movers, starting to pack… and of course putting comments into the thesis from the committee. I wrote back to my (now current) new boss who said we should chat again after I “come up for air” (which is a pretty accurate way of describing it). I went grocery shopping, and for the first time in months it was fun to walk around the store imagining and planning the things I could make in my kitchen. I had spare creative energy again! Partly I needed a full month to revise the thesis because I was making changes to the analysis within the thesis right up to the day before I defended, and I changed the wording on the concluding sentences literally 20 minutes before I presented. I didn’t have time to polish the writing because the analysis was changing so much. The professor who gave me the most detailed comments was justifiably annoyed that he didn’t have sufficient time to read the whole dissertation before the defense. It worked out in the end, because the time he needed to finish reading was a time when I didn’t want to think about my thesis in any way. I even left town and visited friends in Chicago, just to break up the routine that had become so stressful. There’s nothing quite as nice as waking up to a cooked breakfast when you’ve forgotten that cooked breakfasts are an option. There were still thesis revisions to implement. Some major comments reflected the fact that, while some chapters had been edited within a peer group, no one had read it cover-to-cover until after the defense. The professor who had the most detailed comments wrote a 12-page email detailing his suggestions, many of which were word substitutions and thus easy to implement. Apparently I have some tics in my formal writing style. I use slightly too many (~1.2) semicolons per page of text; this reflects my inclination to use compound sentences but also avoid parentheses in formal writing. As my high school teacher, Perryman, taught me: if you have to use parentheses you’re not being confidently declarative, and if you ever want to use nested parentheses in a formal setting, figure out what you really want to say and just say it! (subtext: or figure out why you don’t want to say it, and don’t say it. No amount of parenthesis can make a statement disappear.) Anyway, I’d rather have too many semicolons than too many parentheses; I’d rather be seen as too formal than too tentative. It’s the same argument, to me, that I’d rather wear too much black than too much pink. So, many of the semicolons stayed in despite the comments. Somehow, in the thesis haze, I didn’t think of the option of many simple single-clause sentences. Single-clause sentences are hard. I also used the word “setup” over 100 times as a catch-all word to encompass all of the following: apparatus, configuration, software, procedure, hypothesis. I hadn’t noticed that, and I have no good reason for it, so now my thesis doesn’t use the word “setup” at all. I think. And if it does, it’s too late to change it now! And of course there was the matter of completing the concluding paragraph so it matched the conclusion I presented in my defense seminar. That took some work. I also tried to produce some numbers to complete the description of my analysis in more detail than I needed for the defense seminar, just for archival completeness. But by the time I had fixed everything else, it was only a few hours until my deposit margin-check appointment (and also 2:30am), so I gave up on getting those numbers. The deposit appointment was all of 5 minutes long, but marked the line between “almost done” and “DONE!!!”. The reviewing administrator realized this. She shook my hand three times in those 5 minutes. When it was done, I went outside and there were birds singing. I bought celebratory coffee and a new Wisconsin shirt. And then started packing up my apartment for the movers arriving the next morning. During that month of re-entering society, I had some weird conversations which reminded me how isolated I had been during the thesis. A friend who used to work in our office had started her own business, but I’d only had time to ask her about it once or perhaps twice. When we had a bit of time to catch up more, I asked how it had been during the last few months, and she replied that it had been a year. A year. It just went by and I didn’t notice, without the regular office interactions. I’d gotten into a grove of watching a couple episodes each night of long-running TV shows with emotionally predictable episodic plot lines. Star Trek and various murder mysteries were big. The last series was “House, MD” with Hugh Laurie. By coincidence, when I defended my thesis and my stress level starting deflating, I was almost exactly at the point in the series where they ran out of mysteries from the original book it was based on, and started going more into a soap-opera style character drama. By the time I wasn’t interested in the soap opera aspects anymore, it was time to start reengaging with my real-life friends. A few days after I moved away from Madison, when I was staying with my parents, I picked up my high school routine of reading the local paper over breakfast, starting with the comics, then local editorials. I found (or rather, my dad found) myself criticizing the writing from the point of view of a dissertator. 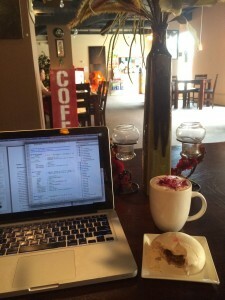 It takes more than a few days to get out of thesis-writing mode. The little nagging conscience doesn’t go away, still telling me that the difference between ok writing and great writing is important, more so now than at any point so far in my career. For the last edits of a PhD, it might be important to criticize at that level of detail. But for a local paper, pretty much anything is useful to the community. At lunch Saturday in a little restaurant in the medieval part of the Italian village of Assergi, I found the antidote. When I can’t read any of the articles and posters on the walls, when I can’t carry on a conversation with more than 3-word sentences, it doesn’t matter anymore if the paragraphs have a clear and concise topic sentence. I need simple text. I’m happy if I can understand the general meaning. The humility of starting over again with Italian is the antidote for the anxiety of a thesis. It’s ok to look like a fool in some ways, because I am a certified non-fool in one small part of physics. It’s not perfect of course: there’s still a lot of anxiety inherent in living in a country without speaking the language (well enough to get by without english-speaking help). I’ll write more about the cultural transition in another post, since I have so many posts to catch up on from while I was in the thesis-hole, and this post is definitely long enough. But for now, the thesis is over. It’s been a crazy 3 weeks since I officially finished my PhD. 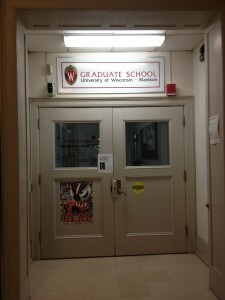 I’m in the transition from being a grad student slowly approaching insanity to a postdoc who has everything figured out, and it’s a rocky transition. 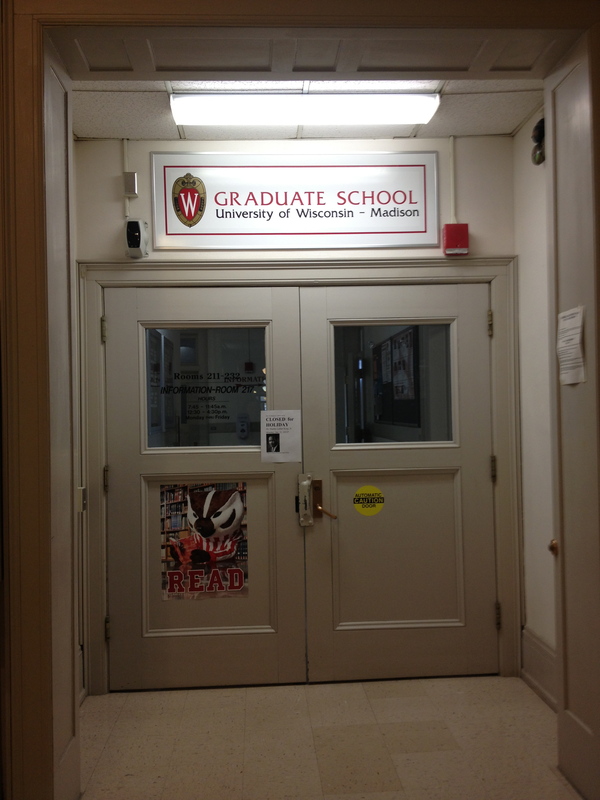 The end of the PhD at Wisconsin has two steps. The first is the defense, which is a formal presentation of my research to the professors and committee, our colleagues, and very few friends and family. The second is actually turning the completed dissertation to the grad school, with the accompanying “margin check” appointment with the grad school. In between, the professors can send me comments about the thesis. I’ve heard so many stories of different universities setting up the end of a degree differently, it’s pretty much not worth going into the details. If you or someone you know is going through this process, you don’t need a comparison of how it works at different schools, you just need a lot of support and coping mechanisms. All the coping mechanisms you can think of, you need them. It’s ok, it’s a limited time, don’t feel guilty, just get through it. There is an end, and you will reach it. The days surrounding the defense were planned out fairly carefully, including a practice talk with my colleagues, again with my parents (who visited for the defense), and delivery burritos. I ordered coffee and doughnuts for the defense from the places where you get those, and I realized why such an important day has such a surprisingly small variety of foods: because deviating from the traditional food is so very far down my list of priorities when there’s the physics to think about, and the committee, and the writing. The doughnuts just aren’t worth messing with. Plus, the traditional place to get doughnuts is already really good. We even upheld a tradition the night before the defense. It’s not really a tradition per se, but I’ve seen it once and performed it once, so that makes it a tradition. If you find it useful, you can call it an even stronger tradition! We played an entire soundtrack and sung along, with laptops open working on defense slides. When my friend was defending, we watched “Chicago” the musical, and I was a little hoarse the next day. When I was defending, we listened to Leonard Bernstein’s version of Voltaire’s “Candide,” which has some wonderful wordplay and beautiful writing for choruses. The closing message was the comforting thought that it’s not going to be perfect, but life will go on. Hearing that at the apex of thesis stress, I think it will always make me cry. By contrast, there’s also a scene in Candide depicting the absurd juxtaposition of a fun-filled fair centered around a religious inquisition and hanging. Every time someone said they were looking forward to seeing my defense, I thought of this hanging-festival scene. I wonder if Pangloss had to provide his own doughnuts. The defense itself went about as I expected it would. The arguments I presented had been polished over the last year, the slides over the last couple weeks, and the wording over a few days. My outfit was chosen well in advance to be comfortable, professional, and otherwise unremarkable (and keep my hair out my way). The seminar itself was scheduled for the time when we usually have lab group meetings, so the audience was the regular lab group albeit with a higher attendance-efficiency factor. The committee members were all present, even though one had to switch to a 6am flight into Madison to avoid impending flight cancellations. 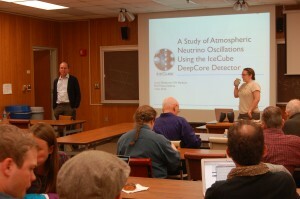 The questions from the committee mostly focused on understanding the implications of my results for other IceCube results, which I took to mean that my own work was presented well enough to not need further explanation. It surprised me, in retrospect, how quickly the whole process went. The preparation took so long, but the defense itself went so quickly. From watching other people’s defenses, I knew to expect a few key moments: an introduction from my advisor, handshakes from many people at the end of the public session, the moment of walking out from the closed session to friends waiting in the hallway, and finally the first committee member coming out smiling to tell me they decided to pass me. I knew to look for these moments, and they went by so much faster in my own defense than I remember from my friends. Even though it went by so quickly, it still makes a difference having friends waiting in the hallway. People asked me if it was a weight off my shoulders when I finally defended my thesis. It was, in a way, but even more it felt like cement shoes off my feet. Towards the end of the process, for the last year or so, a central part of myself felt professionally qualified, happy, and competent. I tried desperately to make that the main part. But until the PhD was finished, that part wasn’t the exterior truth. When I finished, I felt like the qualifications I had on paper matched how qualified I felt about myself. I’m still not an expert on many things, but I do know the dirty details of IceCube software and programing. I have my little corner of expertise, and no one can take that away. Degrees are different from job qualifications that way: if you stop working towards a PhD several years in, it doesn’t count as a fractional part of a degree; it’s just quitting. But if you work at almost any other job for a few years, you can more or less call it a few years of experience. A month before my defense, part of me knew I was so so so close to being done, but that didn’t mean I could take a break. And now, I can take a break. 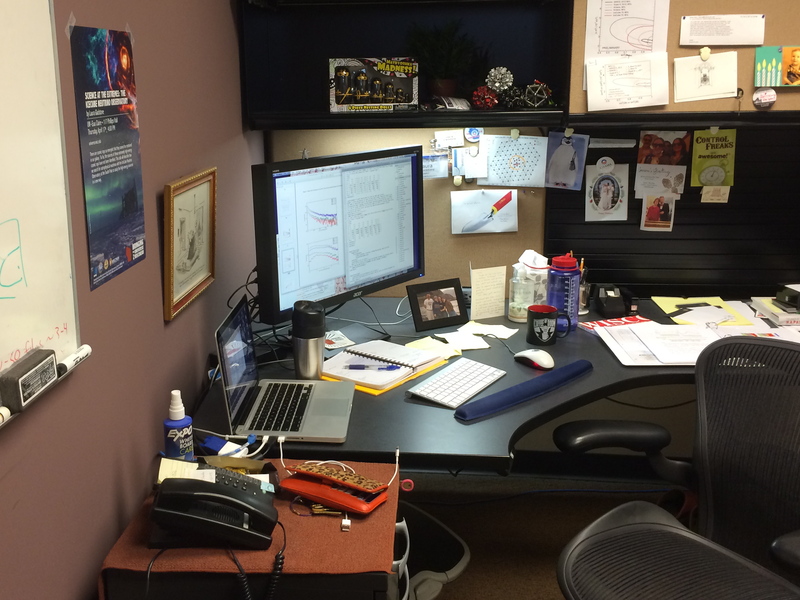 When I joined Quantum Diaries, I did so with trepidation: while it was an exciting opportunity, I was worried that all I could write about was the process of writing a thesis and looking for postdoc jobs. I ended up telling the site admin exactly that: I only had time to work on a thesis and job hunt. I thought I was turning down the offer. But the reply I got was along the lines of “It’s great to know what topics you’ll write about! When can we expect a post?”. So, despite the fact that this is a very different topic from any recent QD posts, I’m starting a series about the process of writing a physics PhD thesis. Welcome. 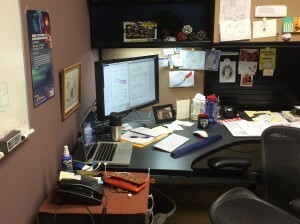 The main thesis editing desk: laptop, external monitor keyboard mouse; coffee, water; notes; and lots of encouragement. There are as many approaches to writing a PhD thesis as there are PhDs, but they can be broadly described along a spectrum. On one end is the “constant documentation” approach: spend some fixed fraction of your time on documenting every project you work on. In this approach, the writing phase is completely integrated with the research work, and it’s easy to remember the things you’re writing about. There is a big disadvantage: it’s really easy to write too much, to spend too much time writing and not enough doing, or otherwise un-balance your time. If you keep a constant fraction of your schedule dedicated to writing, and that fraction is (in retrospect) too big, you’ve lost a lot of time. But you have documented everything, which everyone who comes after will be grateful for. If they ever see your work. The other end of the spectrum is the “write like hell” approach (that is, write as fast as you can), where all the research is completed and approved before writing starts. This has the advantage that if you (and your committee) decide you’ve written enough, you immediately get a PhD! The disadvantage is that if you have to write about old projects, you’ll probably have forgotten a lot. So this approach typically leads to shorter theses. These two extremes were first described to me (see the effect of thesis writing? It’s making my blog voice go all weird and passive) by two professors who were in grad school together and still work together. Each took one approach, and they both did fine, but the “constant documentation” thesis was at least twice (or was it three times?) as long as the “write like hell” thesis. Somewhere between those extremes is the funny phenomenon of the “staple thesis”: a thesis primarily composed of all the papers you wrote in grad school, stapled together. A few of my friends have done this, but it’s not common in my research group because our collaboration is so large. I’ll discuss that in more detail later. I’m going for something in the middle: as soon as I saw a light at the end of the tunnel, I wanted to start writing, so I downloaded the UW latex template for PhD theses and started filling it in. It’s been about 14 months since then, with huge variations in the writing/research balance. To help balance between the two approaches, I’ve found it helpful to keep at least some notes about all the physics I do, but nothing too polished: it’s always easier to start from some notes, however minimal, than to start from nothing. When I started writing, there were lots of topics available that needed some discussion: history and theory, my detector, all the calibration work I did for my master’s project–I could have gone full-time writing at that point and had plenty to do. But my main research project wasn’t done yet. So for me, it’s not just a matter of balancing “doing” with “documenting”; it’s also a question of balancing old documentation with current documentation. I’ve almost, *almost* finished writing the parts that don’t depend on my work from the last year or so. In the meantime, I’m still finishing the last bits of analysis work. It’s all a very long process. How many readers are looking towards writing a thesis later on? How many have gone through this and found a method that served them well? If it was fast and relatively low-stress, would you tell me about it?